Uganda is among a few Sub Saharan African countries claimed to have successfully implemented the Universal Primary Education (UPE) programme. On this premise, the paper attempts to establish the extent to which the UPE programme has contributed to the reduction of child labour in Uganda. It argues that despite the "free" UPE programme, issues related to the quality of primary education and the increasing costs borne by parents have not yet been addressed thus justifying parents to take decisions for their children to drop out/non attendance from school in favour of involvement in child labour. The paper further explores the forms of risks, vulnerabilities and problems encountered by parents in educating their children in primary school and attempts to dig out the coping mechanism they apply to counter the risks. As the debate between abolishing or regulating child labour heats up, the research collects perceptions of the UPE beneficiaries and attempts to determine the possible school of thought favourable for child labour reduction in this community. 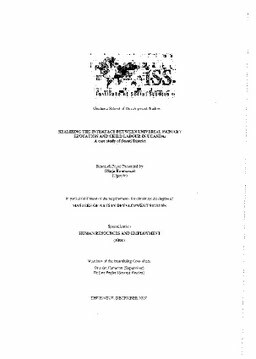 In accomplishing the tasks above, the human capital theory and the sustainable rural livelihood analysis formed the conceptual and analytical basis but backed by primary and secondary data.